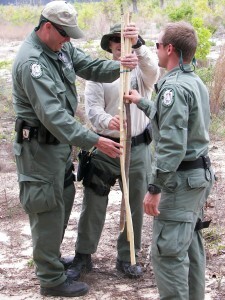 Retired Game Warden Bob H. Lee holds a tracking stick. Scroll down to learn more. 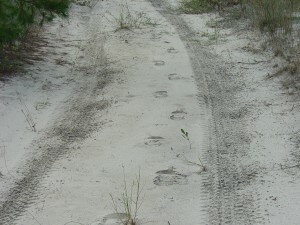 Folks often ask me about the Florida Fish and Wildlife Conservation Commission’s (FWC) man-tracking program. What follows is a bare bones overview using photographs and brief captions to touch on a few of the many interesting topics covered in the 20-hour course. 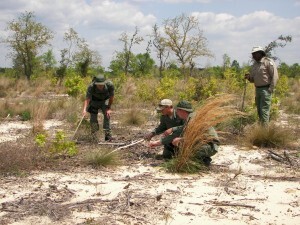 Before students go outside, they attend a two hour indoor class, where they view high resolution photographs illustrating a variety of tracking techniques. In-the-field training begins with the observation games. The objective is to switch the students’ minds from a passive to an aggressive viewing mode in preparation for field tracking exercises, the ability to find articles of evidence, and to improve situational awareness. The memory game entails trying to memorize 25 everyday objects in thirty seconds. It was first mentioned in Rudyard Kipling’s book, Kim, where a young man recruited as a spy plays the Jewel Game, a memory test similar to the one above, except it was played with precious stones. Today, different versions of the game are used by the military to develop a person’s capacity to observe and remember details. An instructor (foreground) hides in a densely forested area. FWC recruits (above) have 30 seconds to visually detect him. Students get four tries, each one progressively more difficult. The instructor begins without a face mask and gloves, then, with each successive attempt dons more camouflage, revealing less of himself to the students. After each try, the students turn their backs and the instructor resets. A second instructor chats up the recruits to provide a necessary distraction while the first one hides, always in a different location. The Bad Guy Drill was developed due to the killing of murder suspect Angilo Freeland, who had gone to ground after killing a Polk County Sheriff’s Deputy, his K-9, and wounding another deputy. Freeland was discovered hiding under a fallen tree tented in vines. He brandished a pistol when confronted by an FWC officer. Five members of FWC’s SOG (Special Operations Group) team fired on Freeland along with four SWAT team officers. A total of 89 rounds were fired. Freeland was hit 68 times. Polk County Sheriff Grady Judd later reported that Freeland was reputed to have assassinated 14 people in South America. 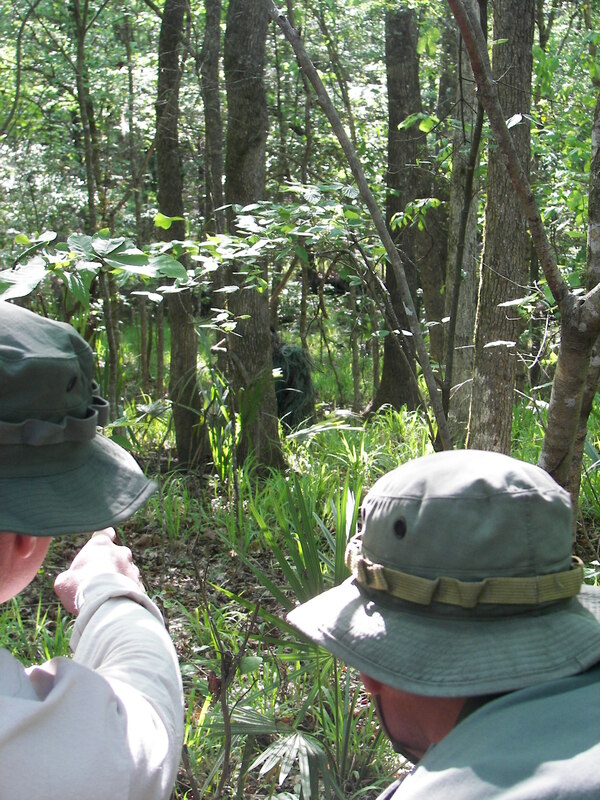 FWC SOG team members point to the instructor partially concealed by a tree in the middle of the frame. He wears a dark-green Gillie suit. The Observation Stand tests the ability to discern everyday objects like hammers, knives, cartridge casings, traps, hand-tools, arrowheads, etc., against a confusing background of forest clutter. 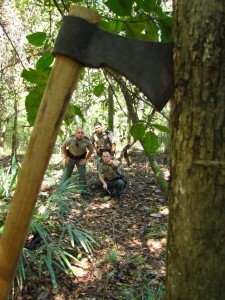 FWC recruits point to the tomahawk, one of 25 objects set out in the woods. Each three-person team is given five minutes to visually detect them from a static position. The average number of items discovered is twelve to fifteen. This game tests students’ ability to puzzle out a tracking scenario. 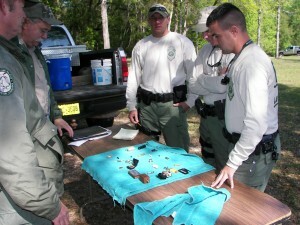 Here, members of Flagler County Sheriff’s Office SWAT team talk out what they see with FWC Instructor Jeff Gier (red shirt). Students are presented with three different tracking problems. The ability to track vehicles and properly determine last known direction is extremely important. 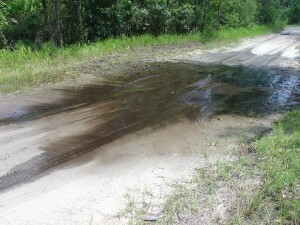 Which direction did the last vehicle go after it passed through this mud hole? Study the slide carefully, and look for where the most recent tire tracks are washed out (the direction the vehicle exited). 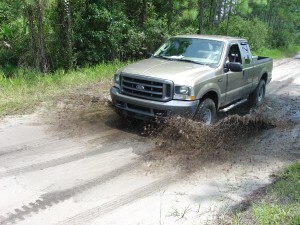 Which side of the mud hole do you see crisp clean tracks entering (the direction the vehicle came from)? Game wardens can read any water hole, big or small within five seconds and tell which way the vehicle last went. Try figuring it out before moving to the next slide. Notice how the undercarriage of this pickup truck drags water up out the hole and deposits it where the truck exits. After the truck passes, the water dragged out flows back downhill and washes out the exiting tire tracks. This technique is an extremely accurate method of determining vehicle direction. One drop of water from the air conditioner of a vehicle moving five miles an hour. Water droplets fall apart in the direction of travel. This vehicle went left. This is a tricky one. Given flat ground and moist sand, the rear tire consistently loses traction and repeatedly slips. 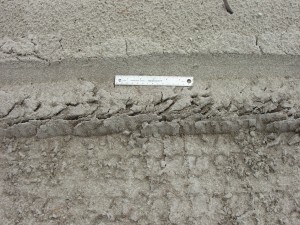 Direction is determined by the pressure cracks below the ruler. They all point at a 45 degree angle back to the right, the direction the vehicle has come from. This vehicle went left. 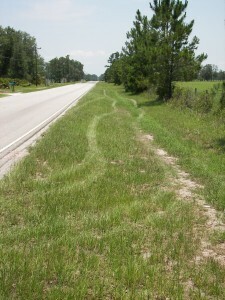 When tire tracks in grass shine, the vehicle is moving away. Tracks coming toward the camera show up as dark stripes. If it was always this easy we wouldn’t need to have a tracking class. 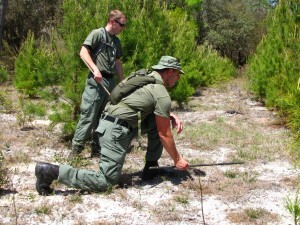 Members of FWC’s SOG team (think rural SWAT team) get their tracking sticks in sync. All of the sticks have rubber bands. One member of this three man team has already taken a stride measurement, heel-to-heel, of an instructor who has laid a track. The other two team members are adjusting their bands accordingly. 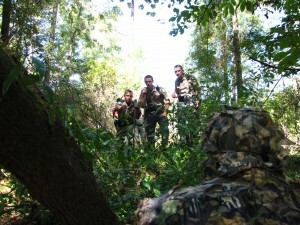 Field tracking exercises are performed by three-person teams, with a point person, and a left and right flanker. The point position is rotated every ten to fifteen minutes. FWC Instructor Ben Johnson stands behind the tracking team. He has laid a track that will take the group about two hours to work out. 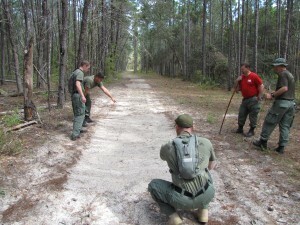 Members of Flagler SO SWAT team following tracks laid by an instructor. 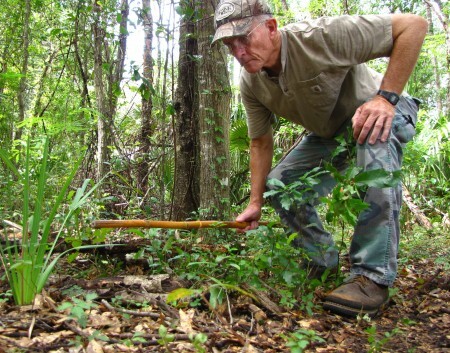 The tracking stick works best when the tracker is kneeling down on the ground and bending slightly forward. 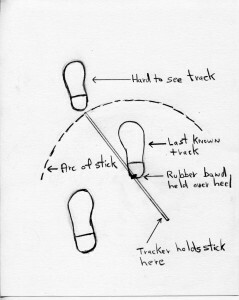 This position offers the best angle to visually check the ground beneath the sweep of the stick’s tip. 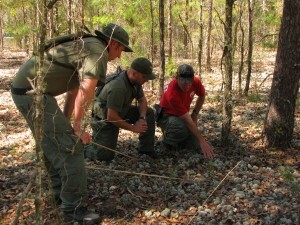 FWC Instructor Scott Dack shows members of Flagler SO SWAT team how to check for tracks in deer moss (slow growing lichen). An interesting forest medium for trackers, when dry they are easily crushed and flattened leaving a distinct impression. When wet they act like a sponge and bounce right back to their original shape after being stepped on. This is the kill site of a deer shot during muzzleloader season, a time of year when only guns loaded from the muzzle–instead of the breech–can be used. 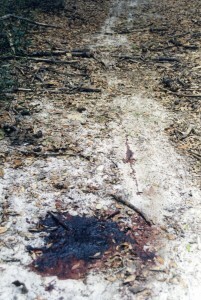 Note the large pool of blood (about 16 inches across), indicating a neck (carotid artery) shot, and drag marks leading away that even a blind boy scout could follow. The suspect was well known to us. He began his life of crime five years before at the tender age of 16, when he killed a 400 pound heifer and dragged it up behind his dad’s mobile home with an all terrain vehicle. At first he told us he’d killed the deer with a .50 caliber patched round ball (a solid round lead bullet commonly used in muzzleloaders) and had shot it through the neck. 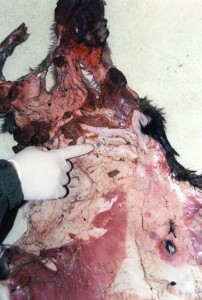 When we examined the hide, Officer Eric Meade pointed out what appeared to be a .30 caliber-size hole in the neck. The suspect then changed his mind and told us the big hole, lower right, was where he shot the deer. That hole was obviously caused by an errant knife cut while skinning the deer. We recovered a freshly fired .30-30 rifle shell casing 50 yards away from the kill site. The suspect stuck to his story. 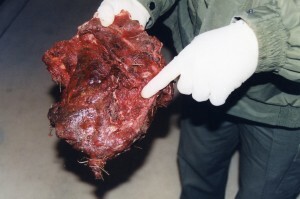 Eric took the neck (above) and the hide, to the medical examiner’s office in Tavares, Florida. After examination, it was determined that a high-speed rifle bullet had passed through the neck and left minute fragments from a copper jacketed bullet. The medical examiner determined the hole in the hide’s neck region was slightly elliptical in shape, measuring .29 caliber in diameter–a lot closer in size to a .30 caliber than a .50 caliber. The suspect pled guilty to the charge of taking deer during muzzleloader season with an unlawful firearm. Since then, he has been caught two more times poaching deer. This case took five Putnam County officers a week to unravel. 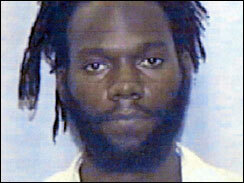 It involved tracking, good interview techniques, and three searches of suspect residences. Deer and turkey were being killed during the closed season on a 1,500 acre cattle ranch. One trail led to several kill sites, another led to a marijuana grow site where we seized 67 plants. The case resulted in 45 felony and misdemeanor charges. By permission of the Palatka Daily News, story written by Kandra Drayton.